Most people hate the idea of aging. Although there is such a thing as "growing old gracefully", having wrinkles on the face can nonetheless be disturbing, especially if you are, technically speaking, still young. 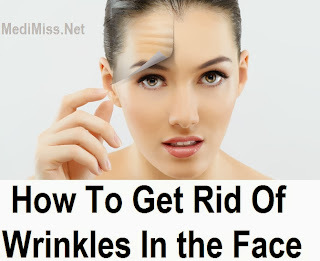 Wrinkles can disfigure your face, resulting to low self-esteem. Wrinkles are not just a beauty issue, after all. They can produce a domino effect beginning with low self-esteem. There are many techniques (naturally and not) of getting rid of wrinkles depending on your budget and personal preferences. One of the more effective and affordable anti-aging treatments today, microdermabrasion is a cosmetic procedure that makes use of a diamond-tipped wand to buff away old and dead skin cells, bringing out smoother and younger-looking skin. It may take several sessions, with each session two weeks apart from each other, before you can see dramatic results. Although there are now available microdermabrasion kits to allow you to do the procedure at home, microdermabrasion is ideally done in a specialized spa or skin clinic by a trained skin specialist. Botox injections are very popular among celebrities. They involve the injection of a toxin into the facial muscle to relax it, smoothening out in the process the fine lines and wrinkles. With Botox, one looks like having just undergone plastic surgery without actually doing so, the reason perhaps why this is one of the most sought-after procedures of today. Botox injections have to be done by an expert to minimize discomfort (although there is relatively very few discomforts reported) and to ensure that no more than what is recommended is administered. The person about to undergo Botox injections has to be properly evaluated as well and cleared of anything that can cause adverse reactions with the drug. Botox effects, while immediate, are only temporary. After two or three months, the wrinkles start to reappear, calling for another Botox shot. This can be expensive over a period of time. A collagen injection is a procedure whereby a substance (collagen) is introduced into the skin to fill or plump it. Very often the injections are intended to augment the lip, giving it a pouty appearance, but collagen injections can also be used to smooth out the fine lines and wrinkles on the face. Like Botox, collagen injections provide temporary effects that typically last for two or three months only. Laser Skin Tightening delivers laser heat into the skin to rejuvenate the skin, giving it a more toned and less wrinkled appearance. The procedure targets the collagen under the skin, heating it up, and causing the muscles to contract. As they do, the skin tightens and appears firmer. Brush away dead skin cells with the soft bristles of a baby brush. This improves blood circulation and stimulates collagen production. Over time, your skin takes on a smoother appearance. Keep your skin from drying. Wash your face clean using a mildly formulated cleanser (one that is not pore-clogging) and then moisturize. Get rid of wrinkles with organic honey which has skin-nourishing properties along with many other benefits. First wash your face with warm water then apply honey thinly over your face. Massage it ever so gently and leave it there for half an hour, enough time for your skin to absorb its benefits. Next rinse it off with water and for a refreshing feel run an ice cube over your face.